Stefanie Smith at Northrop and Johnson writes in to say that Wes Sanford has added two motor yachts to his sales portfolio, the 36.88m Olga and 29.87m Eagle's Nest. Olga was launched by Crescent in 2003 to a Jack Sarin design and has been continuously upgraded since delivery, including a fresh paint job in 2009. Her Robin Rose interior is comfortable, fluid and balanced, the perfect blend of formal and informal. 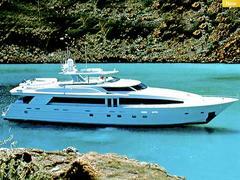 This superyacht sleeps 10 guests in five staterooms and cruises at 18 knots. Olga is on the market asking $9.9 million. Eagle's Nest, a tri-deck motor yacht, was delivered by MCP Yachts in 2007 and has a semi-shaded bridge deck with a large Jacuzzi, sun pads, barbecue and ice maker. Lloyds classed and MCA compliant, she has an on deck master stateroom with two doubles and two twins below. Eagle's Nest is asking $5.995 million.